Dynaplug®, a puncture repair system for tubeless tires, is composed of a stainless steel or aluminum body and removable stainless steel insertion tube (to hold the repair plug). The repair plug, a proprietary rubber impregnated cord mounted to a pointed, non-abbrasive brass tip, ensures ease of insertion and secure sealing for over 97% of punctures. 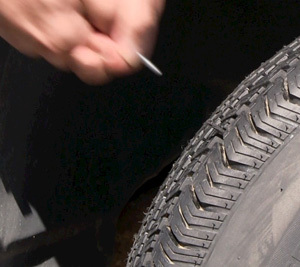 According to research by Michelin cited in Automobile Magazine (April 1990, page 45-47), 97.5% of crown punctures in auto tires are made by objects 4.6mm (about 3/16") or less in diameter. 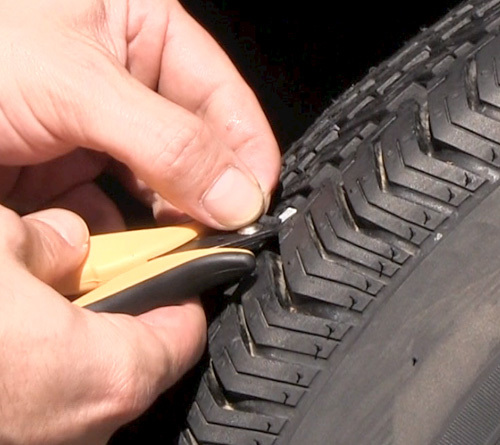 The Dynaplug® has been tested in bias ply and steel belted radial tires in all weather conditions and is suitable for repair of punctures in tubeless tires that range in tread thickness from 3/16"to 1-1/8" at the point of puncture. Dynaplug® was designed for consumer use on cars and small trucks but has found extensive use on motorcycles, lawn equipment, ATV's, golf carts, farm implements, and in commercial shops throughout the United States and around the world. The original Dynaplug® was first featured in the "What's New" section of Popular Science (July 1990) and on the ABC TV Home Show. It is highly regarded by all who have used it as the best and easiest-to-use tire repair solution on the market. Easy Repair without removing the tire - Unlike other tubeless tire repair kits, Dynaplug® allows you to repair a puncture without removing the wheel/tire from the vehicle. This especially saves time and effort in an emergency situation. Low Insertion Force - The shape and size of the penetrating tip allows for easy penetration of most punctures. It's even easier to insert a second plug (when needed) because the first plug lubricates the hole. No Reaming of the Puncture Hole - Because of the low insertion force, it is not necessary to enlarge a puncture hole by reaming. 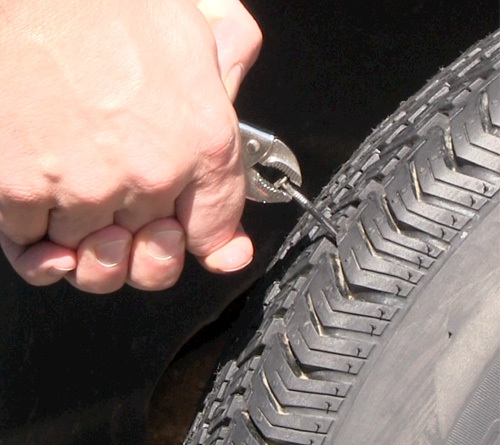 This eliminates the need for a second tool and prevents further damage to the tire caused by reaming the hole to a larger diameter with abrasive tools used in other types of external repair. No Glue Required - After use, tubes of glue dry out in a short time and when you need it again it's not there. 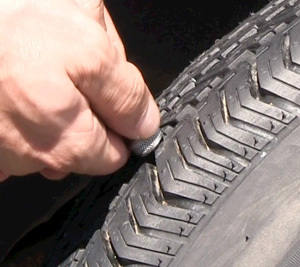 Because Dynaplug® retains its sealing ability indefinitely both during storage and in the tire, no glue is required. Long Lasting Puncture Repair - Viscous rubber of the plug will flow slightly after the plug is in place. This fills small fissures or voids that radiate from the puncture hole into the casing and ensures a long lasting repair. Cavity Handle for Storage - The cavity handle of Dynaplug® allows for convenient storage of plugs and accessories in a neat and clean way suitable for the glove box. 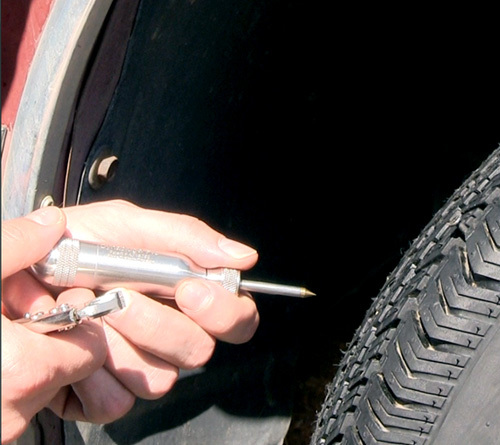 UTAC Certified - UTAC in Linas-Montlhery , France , tested the performance of a Dynaplug® repair plug inserted in a punctured tire of a car. 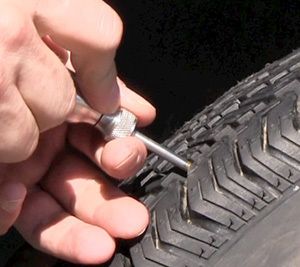 A test tire was pierced by a 3 ½” 16D (penny) nail. The nail was extracted, and the puncture was repaired with a Dynaplug® repair plug. Conformity to technical specifications was received after performance testing in the Dynaplug® repaired tire at speeds up to 150km/h~over 90 mph! UTAC is a leading laboratory officially designated by the French Authorities for all vehicle and equipment tests under European Union directives, and authorized to conduct all tests specified by the regulations of the United Nations Economic Council of Europe.